Mark Bittman writes a column for the New York Times Dining and Wine section called The Minimalist. Additionally, he writes a Times blog called Bitten that's always worth a look. Mark Bittman is one of my food heroes. He likes good food, but backs away from the unnecessary hoopla that often surrounds it. Great ingredients, simply prepared; who could ask for anything more? This week, he took on one of my favorite vegetables, fennel. I run it through a mandoline, throw it in a bowl with some cut up oranges and a handful of cashews and tuck into a bowl of heaven. Really. It tastes like Amalfi. 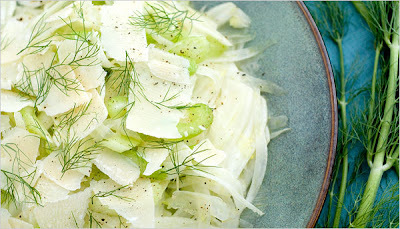 This week, Bittman combined fennel with one of my other favorite vegetables, celery. Fennel and celery have strangely similar textures and it never occurred to me to combine them. This is a perfect counterpoint to a season of holiday overindulgence. 1. Cut fennel bulbs in quarters lengthwise, discarding outer layer if it is exceedingly tough. Use a mandoline to slice quarters thinly; slice celery equally thin. 2. Put sliced fennel and celery into a large bowl and drizzle with olive oil and lemon juice. Season with salt and pepper and toss gently to combine. Top with lots of freshly shaved Parmesan and chopped fennel fronds if you like.